In the end of Decmber we visited Bajau Laut in Davao City, Philippines, where we went fishing and diving at the coast of Samal Island. The Bajau children in Davao learn how to dive in an early age. They have a superb underwater vision and learn how to fish with a harpoon in the age of ten. Swedish scientists have studied the diving skills of Ama in Japan and Bajau Laut in Philippines. The result is fascinating: the divers in both groups stay in general more than 50% of the working time under water while spearfishing or sea harvesting. Erika Schagatay, professor at the department of engineering and sustainable development at Mid Sweden University, has lead the study. The study gives strong support to the idea that repeated diving has played an important role in the human evolution. Read the article here: Underwater working times in Ama and Bajau. The article was published in March 2011 in Diving and Hyperbaric Medicine. In Semporna, Borneo, you can probably find the highest concentration of houseboats in the world. The nomadic lifestyle does also seem to be flourishing, as some of the new houseboats are more robust than many of the stilt houses. Back in Malaysia I visited Danawan island where more than 100 houseboats are anchored from time to time. Danawan is one of the most isolated islands in the region and just one hour boat ride from the Philippines; a country which is frightening many people. “We all come from the Philippines”, one of the Bajau boat dwellers said. “But we can’t live their anymore; some pirates threw fish bombs in to our boats”. In Semporna the Bajau Laut remain their nomadic lifestyle, traveling from island to island or city to city in search for fish and buyers. “We use to travel between Lahad Datu and Semporna”, one man said. “Some of my friends also go to Indonesia”. When I asked if they prefer to stay on the boat instead of in a house, they generally say yes. “We can move freely on the boats”, one woman said, “but we have to avoid the strong waves”. The Bajau Laut generally have a very good health. They eat cassava, sea vegteblaes and fish – a diet which can be recognized as “indigenous”. More or less everyone is slim and they seldom get sick. But the truth is that they can’t afford to be sick – as health care is very expensive for non-Malaysian citizens. “In Malaysia we have security, but we have no support from the government”, the woman said. Without identity card it is impossible to get education and health care. Bajau Laut are literally ignored by the Malaysian government. They can freely dwell in the Malaysian water due to their status as indigenous people, but they have no possibility to gain from the social system. Even if they have stayed there for 10-15 years they can’t get a Malaysian citizenship, as they have no birth certificate and no money. Still, Semporna can be seen as a heaven for Bajau Laut. Here the fishing is good and water is clean – making the spearfishing and dwelling to an ideal lifestyle. Actually they are living in a symbiosis with the thousands of tourists that every year visit Semporna, for diving and recreation. The Malaysian government wants to preserve the fish populations and they know that tourists love the beautiful islands and the exotic stilt houses. Therefore, house building on the islands are more or less impossible, if you don’t get a very expensive permission. But the Bajau Laut, on the other hand, can build as many houses they want – if they keep it small. The waters of Semporna is, hence, both a free state for Bajau Laut and a paradise for the tourists. The houseboat communities live in co-existence with land bounded Bajau communities. Most nomads don’t speak any other language than Sinama and they depend on trade to get cassava and, more recently gasoline. But most fresh water and dry wood can be brought from nearby islands, like Danawan. Bajau Laut are facing discrimination from the surrounding society. They are looked down upon by other Bajau groups who have been in school, learned Malay and adapted to the Malaysian society. “I don’t have any ‘Pala’u’ friend”, one woman in Danawan islands said. “They don’t take a bath for a week”, she explained. In general Bajau Laut have darker skin than other Bajau people and bleached hair, due to the many hours on sea – making their status even lower. Bajau Laut know how to survive and have done so for centuries. But they are put aside by governments and discriminated by their neighbors. They are also increasingly facing problems due to over-fishing and climate change, and who knows what their future will look like. But maybe, as water level rises, their nomadic lifestyle will have a renaissance. Back to the boats! Here comes a link to a reportage in the Swedish Radio and the programme P3 Planet, in Swedish: “De dyker djupare och djupare tills det spricker”. (They dive deeper and deeper till the eardrums rupture). 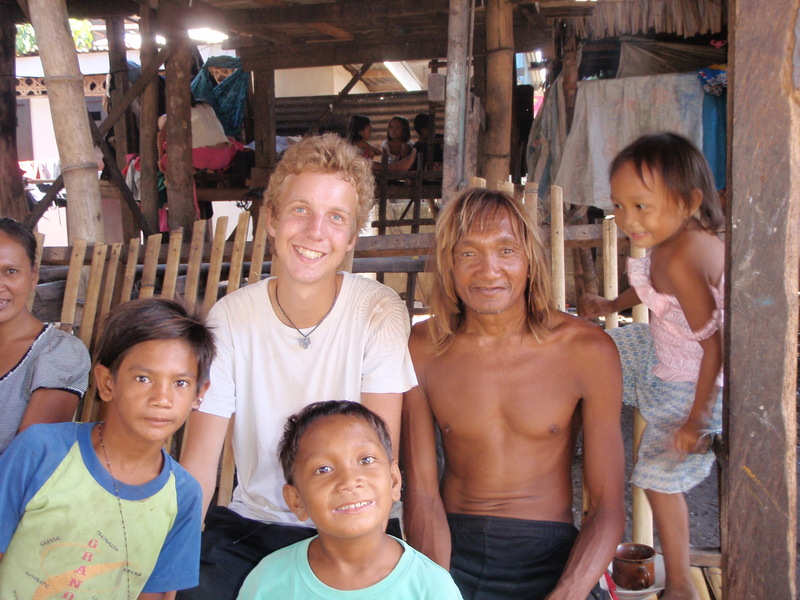 The reportage is about Erik Abrahamsson’s stay with Bajau Laut in the Philippines. How much has a Bajo village changed in 20 years? It was one thing that I wanted to find out when I went to Topa in southeast Sulawesi. Erika Schagatay, a professor in Human Physiology at the Mid-Sweden University, was there for 20 years ago when she documented the diving skills of Bajo fishermen. I brought some pictures from her last trip, and when I arrived to the village they were really excited to the see the old photos. They told me that I was the third visitor in 20 years (an Australian tourist had been there for a couple of years ago), and the children were afraid of me in the beginning, but became soon used to the strange foreigner. So, what about Topa? Actually very little seems to have changed over the last 20 years. Most houses are still of traditional style, nearly every family make their living from the sea, and most children spend half day in water. But of course, some of the inhabitants have mobile phones and many houses has an electricity source. “We came here 60-70 years ago”, the community leader said. “Before we lived on boats, which we had done for centuries before that. We are Sama Asli” – the ‘genuine’. I spent some intensive days in Topa before I started the long journey back to Malaysia. The children became more and more confident with my presence and we went swimming several times. And as you can expect – they are great divers! When I was in Wakatobi I also met a young Bajo man, called Sadar, who is working for the World Wildlife Fund (WWF). His work is to inform Bajo communities about the devastating effects of dynamite and cyanide fishing. “Many Bajo don’t like my work”, he says. “For some of them the ocean is only about business. They only care about catching the fish”. Sadar estimates that as many as 20% of the Bajo fishermen are using destructive fishing methods. “But many of them are still using the pana, the spear”, Sadar says, “and it is mostly businessmen with contacts in Makassar or Manado that are using the bombs”. I ask if there are other groups using dynamites and cyanide, and he says “yes”. “But Bajo is the group that are using most destructive methods. It is sad, but that is the reality”. The WWF-project in Wakatobi has been successful and less and less people are using dynamite in Wakatobi today. “But in other places, as for example in Kendari some miles north of Wakatobi, there are much more illegal fishermen”, Sadar says. “But no conversation project”. The reason is simple: Wakatobi is a national park and is important for the Indonesian tourism industry. Outside the national park it is business as usual.